Though it can’t seem to keep its own services up and running, and is already just about the most expensive carrier in the United States, Verizon Wireless is planning to nickel and dime it’s customers to a new level. Beginning on Jan. 15, Verizon will charge all customers a $2 “convenience fee” for paying their cellphone bill online or over the phone, according to documents obtained by Droid-Life. That’s right. 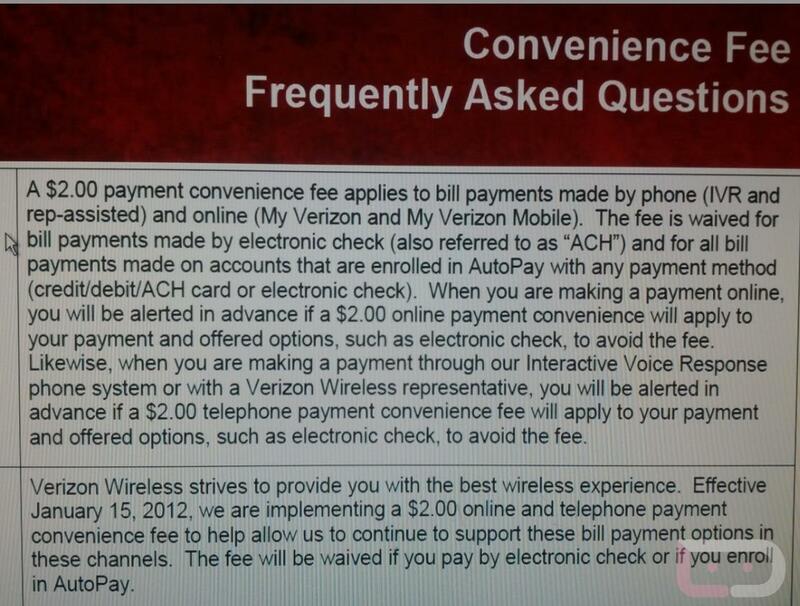 If you’re living in the 21st century and don’t pay your cell phone bills via mailed paper check, you will be charged $2 every month, despite the fact that automated phone payments and online bill paying are likely the two cheapest ways Verizon can accept payment. Of course, AutoPay is a form of online payment, but it must somehow be cheaper to manage than the wild world of standard online payments. Going into the store and paying using a Verizon Kiosk (which connects to the same system that costs $2 at home) or a Rep.
Do you plan to just pay the fee or use alternative forms of payment? This move is not unprecedented as AT&T used to charge for paying bills over the phone (and perhaps still does), but is it right to charge customers a fee just for paying the huge amount of money they already owe?